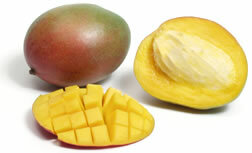 yes it is definitely mango.....otherwise it wud not have got the title of king of fruits...... correct !!!!! I like apples, grapes, and strawberries. I think my favorite though, is fresh picked black cherries, right off the tree. Of course rinse them off first, but they are so good. I remember eating them when I was a child, I would ask my neighbor if I could climb his tree to get some fruit. He always said it was okay, and I never grabbed too many. Now I'm hungry for a black cherry.